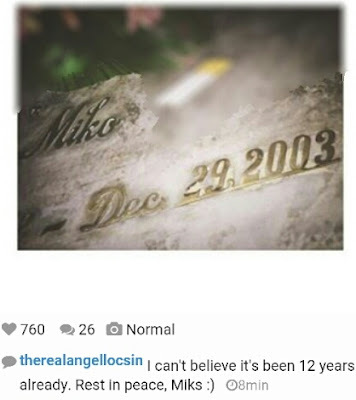 Angel Locsin made sure she would be the first to remember late boyfriend Miko Sotto on the 12th anniversary of his death today, December 29. In his Instagram account, Angel posted a shot of Miko's grave, as he remembers him sharing that she can't believe that it's been 12 years already since his death in 2003. Miko died from a tragic fall from a condo unit. Miko was Angel's first known showbiz boyfriend, before she had Oyo Boy Sotto, Phil Younghusbjnd and of course, current bf Luis Manzano.